These recent publications are filled with actionable, results-oriented, and often provocative guidelines and views. An era of accountability has swept over the higher education landscape. Everyone it seems—legislatures, think tanks, newspapers, magazines, books, and bloggers—wants to “hold colleges and universities accountable.” They are attaching strings to budgets; producing reports that read like exposés; developing clever systems to rank and sort us; and writing books and articles that describe the end of college as we know it. According to them, we need to be reformed, re-imagined, and rebooted. Momentum changes the conversation from how others are holding higher education accountable to why colleges and universities need to embrace the need to demonstrate their own responsibility. The responsibility paradigm that emerges fundamentally shifts the dialogue from fixing to preventing, from reacting to creating, from surviving to thriving. To implement this new paradigm, the dynamics of virtuous cycles are introduced and described. These upward spirals build on their own successes and result in growing confidence—a sense of vitality and resilience. The future of these institutions isn’t the result of outside pressure or reformers. The future is something that can and should be created by those who take responsibility for it. The fundamental questions asked in this workbook are: why do we exist?, what do we want to create?, and what do we believe?. These are the drivers of colleges and universities, and they require focused attention. 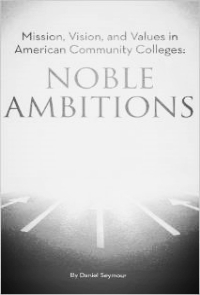 A critical examination of more than 140 colleges and universities is performed with a "Questions to Ask" section in each of the core chapters, followed by a detailed set of nine promising practices. Community colleges have a unique place in the American higher education landscape: they offer low-cost access, workforce skills, and general education for transfer. With more than 1,000 institutions spread across the country, they represent an incredible opportunity—democracy’s colleges—and a valuable asset to the communities they serve. A large-sample critical examination of these institutions’ noble ambitions—their mission, vision, and values—reveals a broad range of ineffective efforts as well as promising practices in each of these areas. Moreover, a framework provides the link between noble ambitions and actions in the form of alignment with strategic planning. Recommendations seek to provide institutions with strategic options for creating purposeful change.